Sydney Finkelstein, the Steven Roth professor of management at the Tuck School of Business at Dartmouth College in Hanover, N.H., published Why Smart Executives Fail eight years ago. In it, he shared some of his research on what more than 50 former high-flying companies – including Enron, Tyco, WorldCom, Rubbermaid and Schwinn – did to become complete failures. It turns out that the senior executives at the companies all had seven habits in common. 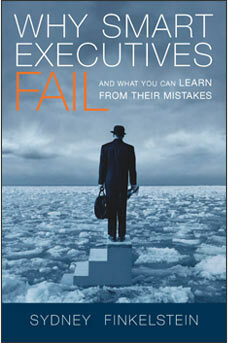 Prof. Finkelstein calls them the seven habits of spectacularly unsuccessful executives. This first habit may be the most insidious, since it appears to be highly desirable. Shouldn’t a company try to dominate its business environment, shape the future of its markets and set the pace within them? Yes, but there’s a catch. Unlike successful leaders, failed leaders who never question their dominance fail to realize they are at the mercy of changing circumstances. They vastly overestimate the extent to which they actually control events and vastly underestimate the role of chance and circumstance in their success. CEOs who fall prey to this belief suffer from the illusion of personal pre-eminence: Like certain film directors, they see themselves as the auteurs of their companies. As far as they’re concerned, everyone else in the company is there to execute their personal vision for the company. Samsung’s CEO Kun-Hee Lee was so successful with electronics that he thought he could repeat this success with automobiles. He invested $5-billion (U.S.) in an already oversaturated auto market. Why? There was no business case. Mr. Lee simply loved cars and had dreamed of being in the auto business. Like the first habit, this one seems innocuous, perhaps even beneficial. We want business leaders to be completely committed to their companies, with their interests tightly aligned with those of the company. But digging deeper, you find that failed executives weren’t identifying too little with the company, but rather too much. Instead of treating companies as enterprises that they needed to nurture, failed leaders treated them as extensions of themselves. And with that, a “private empire” mentality took hold. CEOs who possess this outlook often use their companies to carry out personal ambitions. The most slippery slope of all for these executives is their tendency to use corporate funds for personal reasons. CEOs who have a long or impressive track record may come to feel that they’ve made so much money for the company that the expenditures they make on themselves, even if extravagant, are trivial by comparison. This twisted logic seems to have been one of the factors that shaped the behaviour of Dennis Kozlowski of Tyco. His pride in his company and his pride in his own extravagance seem to have reinforced each other. This is why he could sound so sincere making speeches about ethics while using corporate funds for personal purposes. Being the CEO of a sizable corporation today is probably the closest thing to being king of your own country, and that’s a dangerous title to assume. Here’s the image of executive competence that we’ve been taught to admire for decades: a dynamic leader making a dozen decisions a minute, dealing with many crises simultaneously, and taking only seconds to size up situations that have stumped everyone else for days. The problem with this picture is that it’s a fraud. Leaders who are invariably crisp and decisive tend to settle issues so quickly they have no opportunity to grasp the ramifications. Worse, because these leaders need to feel they have all the answers, they aren’t open to learning new ones. Leaders who need to have all the answers shut out other points of view. When your company or organization is run by someone like this, you’d better hope the answers he comes up with are going to be the right ones. At Rubbermaid they weren’t. The company went from being Fortune’s most admired company in America in 1993 to being acquired by the conglomerate Newell a few years later. CEOs who think their job is to instill belief in their vision also think that it is their job to get everyone to buy into it. Anyone who doesn’t rally to the cause is undermining the vision. Hesitant managers have a choice: Get with the plan or leave. The problem with this approach is that it’s both unnecessary and destructive. CEOs don’t need to have everyone unanimously endorse their vision to have it carried out successfully. In fact, by eliminating all dissenting and contrasting viewpoints, destructive CEOs cut themselves off from their best chance of seeing and correcting problems as they arise. Sometimes CEOs who seek to stifle dissent only drive it underground. Once this happens, the entire organization falters. At Mattel, Jill Barad removed her senior lieutenants if she thought they harboured serious reservations about the way that she was running things. Mr. Schmitt created such a threatening atmosphere at Rubbermaid that firings were often unnecessary. When new executives realized that they’d get no support from the CEO, many of them left almost as fast as they’d come on board. Eventually, these CEOs had everyone on their staff completely behind them. But where they were headed was toward disaster. And no one was left to warn them. You know these CEOs: high-profile executives who are constantly in the public eye. The problem is that amid all the media frenzy and accolades, these leaders’ management efforts become shallow and ineffective. Instead of actually accomplishing things, they often settle for the appearance of accomplishing things. Behind these media darlings is a simple fact of executive life: CEOs don’t achieve a high level of media attention without devoting themselves assiduously to public relations. When CEOs are obsessed with their image, they have little time for operational details. Tyco’s Dennis Kozlowski sometimes intervened in remarkably minor matters, but left most of the company’s day-to-day operations unsupervised. As a final negative twist, when CEOs make the company’s image their top priority, they run the risk of using financial-reporting practices to promote that image. Instead of treating their financial accounts as a control tool, they treat them as a public relations tool. The creative accounting that was apparently practised by such executives as Enron’s Jeffrey Skilling or Tyco’s Mr. Kozlowski is as much or more an attempt to promote the company’s image as it is to deceive the public: In their eyes, everything that the company does is public relations. Part of the allure of being a CEO is the opportunity to espouse a vision. Yet, when CEOs become so enamoured of their vision, they often overlook or underestimate the difficulty of actually getting there. And when it turns out that the obstacles they casually waved aside are more troublesome than they anticipated, these CEOs have a habit of plunging full steam into the abyss. For example, when Webvan’s core business was racking up huge losses, CEO George Shaheen was busy expanding those operations at an awesome rate. Why don’t CEOs in this situation re-evaluate their course of action, or at least hold back for a while until it becomes clearer whether their policies will work? Some feel an enormous need to be right in every important decision they make, because if they admit to being fallible, their position as CEO might seem precarious. Once a CEO admits that he or she made the wrong call, there will always be people who say the CEO wasn’t up to the job. These unrealistic expectations make it exceedingly hard for a CEO to pull back from any chosen course of action, which not surprisingly causes them to push that much harder. That’s why leaders at Iridium and Motorola kept investing billions of dollars to launch satellites even after it had become apparent that land-based cellphones were a better alternative. Many CEOs on their way to becoming spectacularly unsuccessful accelerate their company’s decline by reverting to what they regard as tried-and-true methods. In their desire to make the most of what they regard as their core strengths, they cling to a static business model. They insist on providing a product to a market that no longer exists, or they fail to consider innovations in areas other than those that made the company successful in the past. Instead of considering a range of options that fit new circumstances, they use their own careers as the only point of reference and do the things that made them successful in the past. For example, when Jill Barad was trying to promote educational software at Mattel, she used the promotional techniques that had been effective for her when she was promoting Barbie dolls, despite the fact that software is not distributed or bought the way dolls are. Frequently, CEOs who fall prey to this habit owe their careers to some “defining moment,” a critical decision or policy choice that resulted in their most notable success. It’s usually the one thing that they’re most known for and the thing that gets them all of their subsequent jobs. The problem is that after people have had the experience of that defining moment, if they become the CEO of a large company, they allow their defining moment to define the company as well – no matter how unrealistic it has become. The bottom line: If your boss or several senior executives at your company exhibit several of these traits, now is the time to start looking for a new job.